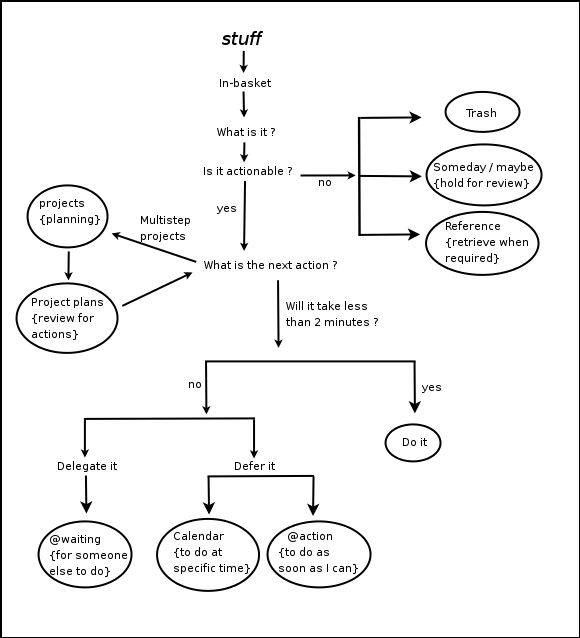 I have been using David Allen’s Getting Things Done(GTD) for a while now. I have finally finished the book which was ironically one of the things I had labeled to get done! A few months ago I wrote a review on Nozbe, an online website and cloud service that implements the GTD theory. I really got excited once I installed the iPhone app for it. Anytime I had an idea, reminder for myself, etc…I would just grab my iPhone and open up the Nozbe app. When I was on my computer, either at home or at work, I would just log into Nozbe’s website and off I would be running. It was working fine except for one thing… I really wanted an integrated system that used GTD for my physical reminders as well as all my emails. I own my own domain(you’re at it, my friend…), and I use Gmail’s service Google Apps for my e-mail. The service is free for me(Standard Edition), but the features are outstanding. Over 7Gb of storage, integration of IMAP, and Gmail’s excellent implementation of labels and filters. On top of that, one little feature in Contacts that I will get to in a minute. One thing Nozbe has been unable to do, is attach an e-mail to an individual action. You can attach them as a note to a project but not to the actions. This is key to integrating reminders about emails you receive. When I get e-mails, I decide what I want to do with them. Using GTD, if it is less than a 2 minute time frame, I just deal with it. Longer than that, or at sometime in the future, I need to get it out of my inbox, and someplace I can retrieve it later. So, digging around, I found this great article about how to implement Gmail with GTD…The process is the same under Google Apps too! Wherever they mention using username+label@gmail.com just replace the gmail.com part with your domain name. All the projects go directly to the top of my labels by adding the period to the start. Everytime I have a new project, I just create a new label starting with “/.project_name”. One thing that is great about Gmail is it’s ability to add(or remove) multiple labels to an item. So, if I am working on a project, I can add multiple actions to one project(like calling a client, e-mailing my boss, looking up a policy), and then Star my Next Action items. Once done, I remove the Star and context label, I can then go back to my project and label the next action item to progress through the project. It is so easy to either look at my projects view, or my contexts view. The next big step to make reminding yourself easy is, Setting up Contacts. Create a new contact and label it the context you wish your action item to go to. As an example, I have a contact labelled “Call” that routes all e-mails to it to my @call context and skips the Inbox. A pretty simple process really. One step that I did that went a bit further than the David Allen article is that I created a new group in my Contacts to keep track of all these Contacts. That way it is easier to find them in my hundreds of contacts I have in Google Contacts if I need to check out one of these “fake” contacts. Lastly to tie the whole system together, Setting up Filters! I set up my filters almost identically to the article except that I didn’t have anything in “From”. That way if I am sending reminders from any email account, whether from my personal email address, work email address, or from any future unknown email, I don’t need to amend my filters. Once everything is set up, the system works great! It works for me at home, at the office, and on my iPhone(Gmail on the iPhone via Microsoft Exchange). With Gmail’s huge storage, permanently archiving all my messages and reminders, and it’s powerful filters, using Gmail as a GTD solution is a no brainer!